WASHINGTON: President Ashraf Ghani has said that the Afghan National Army will not last more than six months without US support and the Afghan government will also collapse. 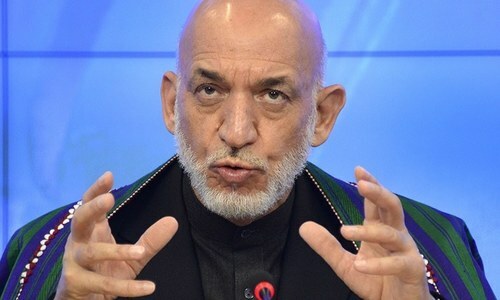 Mr Ghani acknowledged his government’s almost absolute dependence on Washington in an interview to a television show CBS 60 Minutes, broadcast earlier this week. 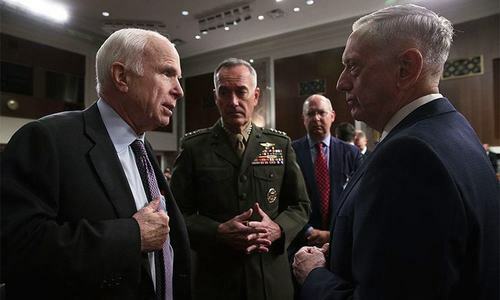 But Gen John Nicholson, the commander of US forces in Afghanistan, said in the same programme that with America’s new strategy and with increased US pressure on Pak­istan to cooperate, he was certain he could win Washington’s longest war, which was now in its 16th year. “From the resource perspective, they are absolutely right. We will not be able to support our army for six months without US support, and US capabilities,” President Ghani responded. “Did you just say that without the US support your army couldn’t last six months?” the journalist, Lara Logan, asked again. “Yes. Because we don’t have the money,” Mr Ghani said. 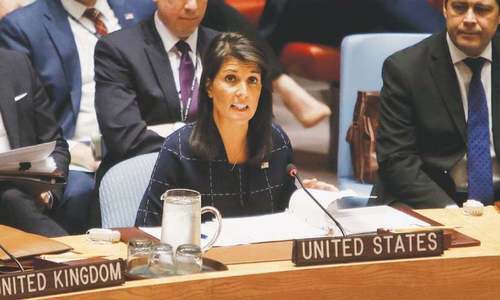 The US contributes around 90 per cent of Afghanistan’s defence budget and observers in Washington say that in 16 years the US and its allies have only made some moderate gains. They claim that the Taliban still control large chunks of land in the Pashtun belt and the government in Kabul has so far been unable to dislodge them. In the interview, President Ghani also acknowledged the threatening presence of 21 international terrorist groups in his country, adding that dozens of suicide bombers were also being sent to Afghanistan. This campaign of terrorism, he added, brought out “angry protesters in the capital chanting death to Ashraf Ghani”. “If you can’t secure the capital, how are you going to secure the rest of the country?” the journalist asked. “You tell me. Can you prevent the attack on New York? Can you prevent the attack on London?” Mr Ghani replied. Last week US officials said the Pentagon would deploy an estimated 1,000 new combat advisers to Afghanistan and would send additional drones and helicopters. I like honest and candid people. Wait. Where did the $2 trillion go? Another way to beg for more money. Wasted almost $2 trillion already with nothing to show for it anywhere in the country. What this dumb Ghani is doing there. If he can’t deliver any thing positive for his country, than this begger has to leave the seat for someone who can deliver. Shameless man. The puppet is a failure and under heavy pressure by people to quit . Abdullah Abdullah is non-elected and calling the shots. Today, all US personnel take helicopters to travel between Kabul airport and the city. Afghanistan will revert to old status. War will only end with peace talks. History shows that war in Afghanistan cannot be won militarily. Americans are not going anywhere. @SATT Are you crazy. There are a lot of Americans there, we want and pray for them to comeback with their families. So trillions wasted. Well done, USA. I fear USA will collapse if they continue helping Afghanistan as did USSR in 1980. @SATT not going anywhere until they colleps like Russia. Russia is waiting for the revenge and Afghanistan will be Russians revenge! @SATT That brings Vietnam to mind. I wonder why..
What a waste of countless innocent lives and waate of a trillion dollars. Had thsee resources been used properly rather than theigh war, the world would been a better and a safer place. @Trump Et The trillion dollars was used to purchase high end properties in Dubai and such. Reality check. Cosmetic approach has always a short term solution. Bring main stakeholders on table and find a permanent solution, that is what Pakistan is advocating for. Perhaps he should resign and join the Taliban. Just get ready to taken over by those you tried so hard to distrust. Why not negotiate peace. Where have those trillions of dollars and training gone? $ 1 trillion, world's most powerful militaries with most sophisticated technologies and weapons couldn't just defeat few thousand Talibans in 16 years. But psychologically they have admitted now. 1$ trillion spent during the last sixteen years without having peace and stability in Afghanistan. Taliban's occupies over 50% territory, regular attacks on civilian and security forces are the hard ground realities to accept - doesn't this shows, total mess and failure of USA and NATO forces in Afghanistan? As a nation they need to stand on their own. Well, he was right at the end by terming theUS new policy 'The End Game'. However, it is not clear for whom? Around $2 trillion wasted on this hopeless war. Get out and stop the drain on the economy. Sooner it is, the better it would be for the people of Afghanistan. @Manik Sharma. Agreed. If a nation cannot stand on its own two feet, as many nations cannot, then a system has to found, on how should these nations be governed and not become sanctuaries for different violent groups. Many nations in Asia, Africa, South America cannot stand on their own, the question is how to make them a viable entity, so they do not fall into an abyss, as Afghanistan has. This is the challenge. Sir you can not survive without Pakistan. Even you should respect Pakistan for the help and support they put forward to Aghans. shame on You! US is not a friend! What has US achieved in all those 16 years of war? They are only best putting blame on others. These are the blessing of proxy war. Americans didnt learn from vietnam. Who e er is on the ground wins the battle. In the end these war criminals will leave just like russians. And taliban will be back. These war criminals can fly drones but cant go out side their compouds.. they are like chickens in a cage. To scared to go out and fight like a man. Then say large areas are controlled by taliban....is that a joke. Now Ghani want more dollors for himself. He is blackmailing US, just as US blackmail her old friends. gen nicholson: you will have to define what you mean by ‘win this war’. no invader has EVER really won a war in Afghanistan - and i doubt that is about to change with Bush W misadventure. And Sir, tell us how long Pakistan economy and military survive without US help? Why you have to go to IMF very often to secure money even under very unfavourable conditions and higher rates of interests? Ashraf Ghani, and before him, Hamid Karzai, are two very capable leaders. The problem is, Washington wants to impose on Afghanistan it's will which the wast majority of Afghanistan is against. The sooner Washington realizes this, the better. Gotta love the honesty from these people.